Following up on yesterday's post featuring Topps original art for a 1959 Duke Snider card, I now share a couple of great vintage Dodger oddball items that struck my fancy. 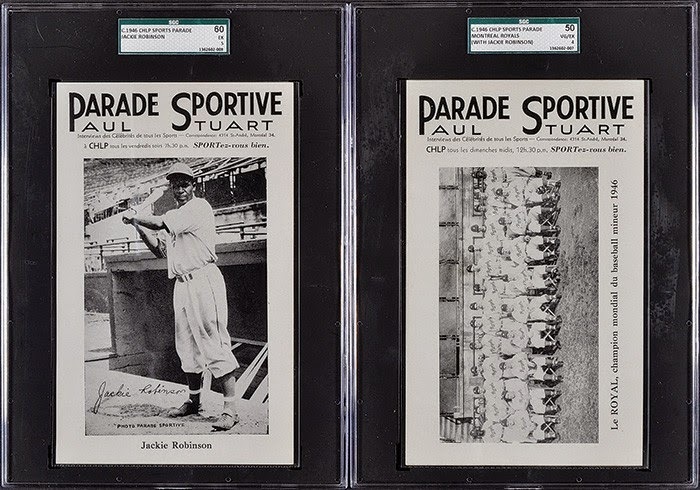 Below are a couple of large-sized premium photos distributed only for the Montreal, Canada marketplace during the 1940's called Parade Sportive (Sports Parade in English). They were made in conjunction with a local radio show called Parade Sportive. The two photos below feature future Hall of Famer Jackie Robinson during his first season as a member of the Dodgers franchise. As you know, Jackie spent his first season as a Dodger playing for the Montreal Royals. These two photos are from 1946. The youngster earned his nickname not for his diminutive size—he was five feet nine inches and weighed 140 pounds when he signed his first professional contract at the age of twenty, and added one inch and twenty pounds when fully grown. 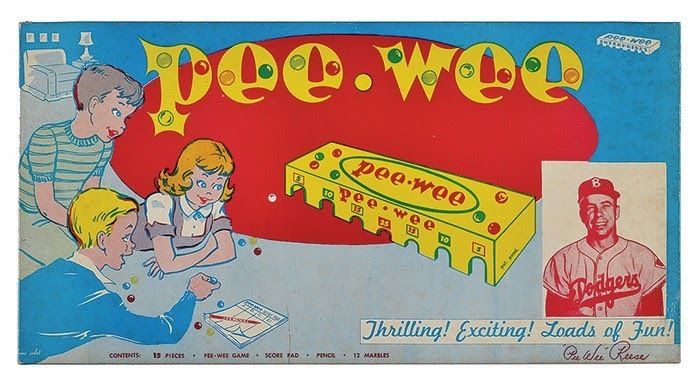 Instead, he was called Pee Wee because of his predilection for playing marbles. 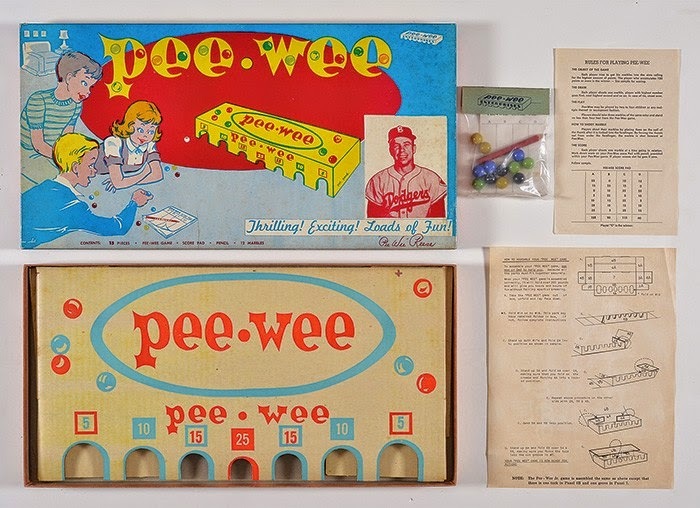 As a pre-teenager, he was runner-up in a Louisville Courier-Journal pee-wee marbles competition. Weekend Autograph Opportunities: Garvey, Cey and Chuck Finley Signings! The 62nd Annual California RV Show will be at the Fairplex in Pomona over the next couple of weeks and several players will be there to sign autographs this weekend and next. Go here for information. Steve Garvey's newest edition of 'Garvey and Friends" at San Manuel Indian Bingo and Casino will be on Tuesday, October 14th, starting at 7:00 PM. His featured guest will be Hall of Famer Reggie Jackson. Tickets at $40.00; including dinner. Go here for more information. Things started out well for the Dodgers. 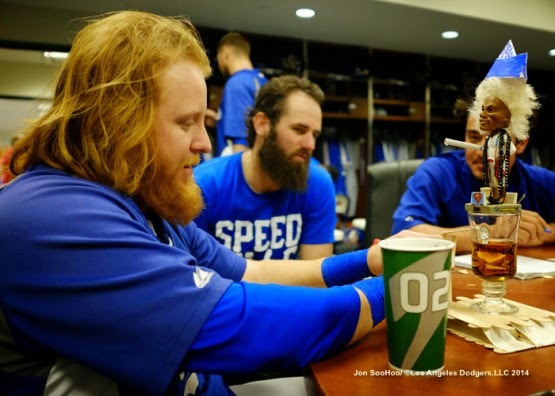 They had MVP candidate Clayton Kershaw on the mound and the Dodger Jobu all gussied up and pretty in the clubhouse. Unfortunately, the Baseball gods struck us down with its mighty hammer and gave us the blues. The pic above is via Jon SooHoo/LA Dodgers 2014. Go here to see more photos of his from yesterday. I won't bother recounting any details of the Dodgers loss, or provide explanations as to why it happened. I just think that's all a big waste of time right now. Instead, I'd like to take this brief moment to say thanks to the team for a wonderful season of Dodger Baseball. Most of all, I'd like to say thanks to all of you for visiting my little blog. It's been a fun year and and I promise next year will be even better. As you might have guessed, posting is likely to decrease over the coming days and weeks (maybe), but I won't be disappearing. Baseball collecting never ends and I suspect this winter will be filled with plenty of Dodger news. BTW, the LA Kings hockey season officially starts tonight, so we've (assuming your a fan) got that to immediately look forward to. Go Kings Go! Read Don Mattingly's postgame interview with the press after Game 4, here. I mean, Holliday hits the ball barely out of reach of Dee, Peralta hits the ball and it hits off Hanley's glove, and then had a curveball there. So at the end of the day, I think it's not really a situation that you try to change too much or manipulate too much. Via Ken Gurnick at MLB.com, "Right-hander Beckett announces plans to retire." "I just don't see me going through that rehab and coming back to pitch at this point in my life," he said. Yasiel Puig was playing through an ankle issue, Via Dylan Hernandez of the LA Times. His benching for Game 4 suddenly make a lot of sense. He had difficulty getting around on the fastball due to his ankle. Via Chris Olds at Beckett, Panini America recently announced they will be released a card set called Panini Classics. Check out some preview pics here. 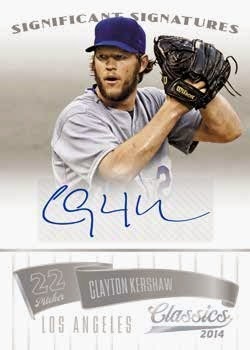 To the right is an autographed Clayton Kershaw card. Here's the first bit of Dodger winter news. Per Chris Cotillo of MLB Daily Dish on twitter, Brian Wilson has already told the Dodgers that he will exercise his $9Mil option for 2015. No kidding, eh? Sources: Brian Wilson has informed #Dodgers that he will exercise his player option for 2015. Via the LA Kings, "Discovery Cube LA Partners with LA Kings to Celebrate the Science of Hockey in a Permanent New Exhibit." “The Science of Hockey” will debut in early 2015 at the new Discovery Cube Los Angeles (DCLA) as one of the most technically advanced sports-themed exhibits in the world. Announced for the first time today by representatives from the Discovery Science Foundation (DSF) and the Kings Care Foundation, the permanent destination attraction will combine hands-on hockey learning focused on the skills of the sport with unique participatory experiences that explain the scientific realities of the game.